Pumpkin season is back friends! I repeat, Pumpkin season is BACK and I could not be happier about it. The obsessive planner in me has already lined up a pumpkin patch visit and have moved my blazers, boots, and scarves to the front of my closet even though it’s still in the 80s/90s in Los Angeles, I am also proud to admit that I have joyfully consumed an unbelievable amount of Pumpkin Spice Lattes since they returned to all of the cafes near my place just a few weeks ago. This past weekend when I was daydreaming of all the fun things I get to do this season I started to think about different recipes I could experiment with. Each Fall, I look for new ways to highlight my favorite ingredient. I usually attempt to vamp up my favorite recipes by making a more seasonally appropriate version, a pumpkin version. I’ve done pumpkin chocolate chip cookies, pumpkin bread, and pumpkin pancakes. 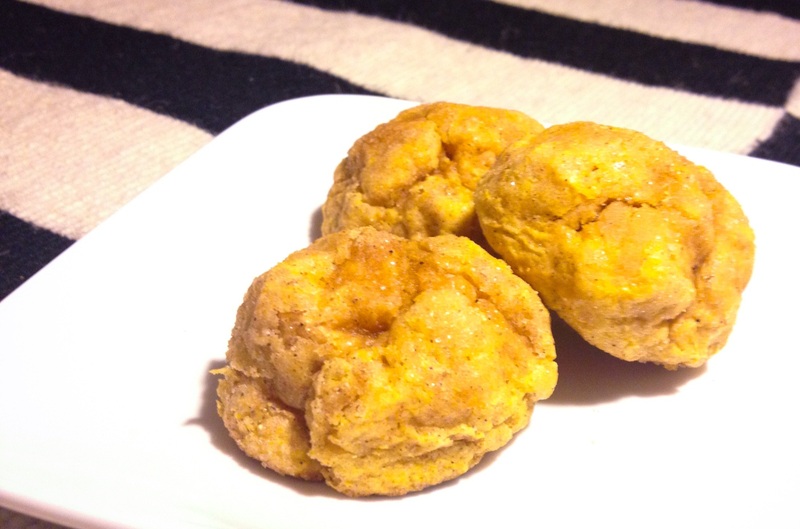 This year is no different, I’m happy to share my newest Pumpkin treat – Pumpkin Snickerdoodles. What? Yes friends, the most delicious cookie in the history of all cookies has gotten even better. Take dough out of refrigerator. Scoop small mounds (about 1 Tb.) of dough and roll in sugar & spice mixture, cover completely.